"A delicious way to use up your blueberries!" Very good - I used fat free vanilla yogurt and skim milk (reduced that a bit to keep it thicker). I cut back on the sugar a bit as well and added some cinnamon along with the nutmeg. I did not add sweetener, and used soy milk instead of cow's milk. Great recipe as is, but the addition of 2 peaches made it much more to my liking! Delicious. 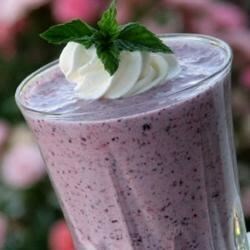 I made this with frozen blueberries, lemon Greek yogurt, and added a little less nutmeg than the recipe indicated. It was perfect and wonderful for a hot summer morning.